“The Economic moat” is competitive advantage, which enables a company to earn sustainable profits over the longer period of time. Companies sustaining advantage over 10 years possess wide economic moat. It is difficult to find out the companies with wide moat. Out of the total companies covered by Morningstar, only 15% companies possess wide moat whereas 45% possess narrow moat and remaining 40% were the companies with no moat. Sources of moats can range from intangible assets, switching costs, network effect, cost advantage and efficient scale. These sources differ from industry to industry. Some of the industries which are highly competitive in nature have lower probability of moat. Heather introduced “Efficient Scale” which is a unique source of moat found in smaller markets like Australia and New Zealand. This moat arises due to the limited market size, which makes it unattractive for a new or larger. The general way to identify the company with economic moat is to evaluate if the customers are ready to pay the premium for a company’s product. If yes, then what is the magnitude of that premium vis a vis competitors. Formulating and applying this framework can help you to identify the companies with wide moat. But that would tell only the half of the story. Because valuations are equally important. A company with wide moat, whose valuations are expensive, may not generate attractive returns. 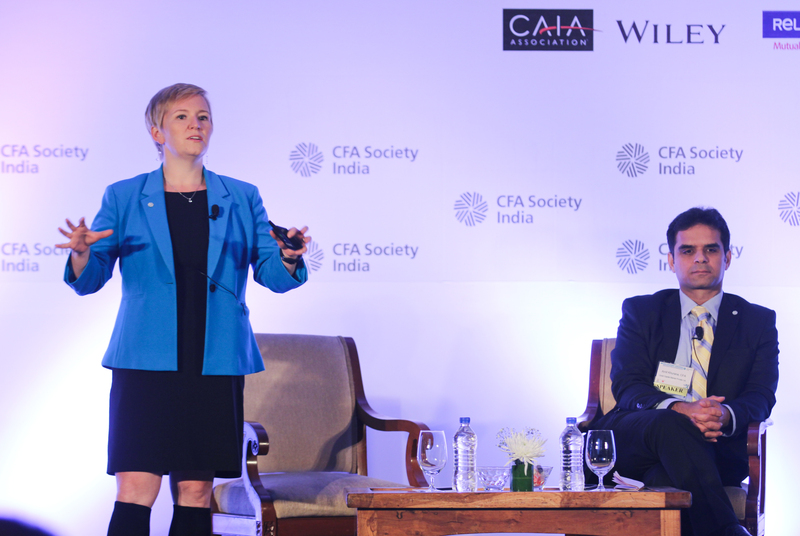 This entry was posted in India Investment Conference, Mumbai and tagged @CFAIndia, @CFAInstitute, @iaipcfa, Amit Khurana CFA, CFA Institute, Dolat Capital, Heather Brilliant CFA, Indian Association of Investment Professionals, Morningstar, Rajni Dhameja CFA. Bookmark the permalink.